Click the cover images for a fuller description of each book. Adams, Richard. Watership Down. Mass-market paperback, 496 pages. A group of rabbits must undergo a perilous journey to establish a new warren. 1972 Carnegie Medal. Bujold, Lois McMaster. The Vor Game. Mass-market paperback, 345 pages. Miles Vorkosigan’s first assignment is intended to teach him respect for the chain of command, which goes about as well as could be expected. Fourth in a Hugo-winning series—read The Warrior’s Apprentice first. 1991 Hugo Award winner. Chabon, Michael. The Yiddish Policemen’s Union. Hardcover, 432 pages. A murder mystery set in a world where the post-World War II Jewish homeland was established in Alaska. 2008 Hugo, Nebula, and Locus Award winner. 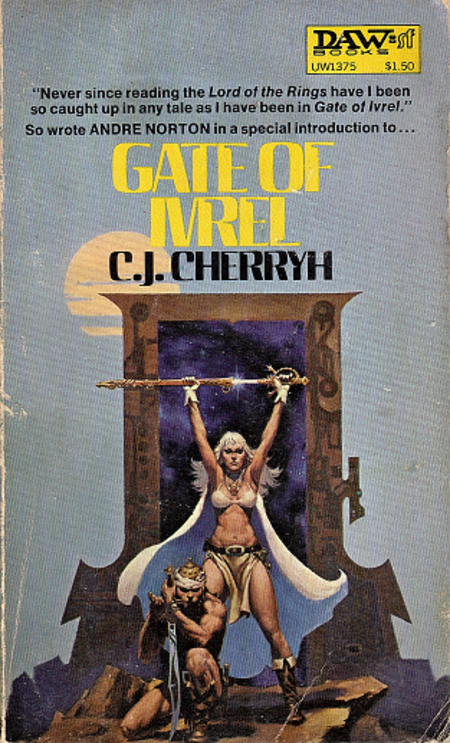 Cherryh, C. J. Gate of Ivrel. Mass-market paperback, 191 pages. From back cover: “Scattered about the galaxy were the time-space gates of a vanished but not forgotten alien race. Now the task was to uproot these gates….” First in a series. Heinlein, Robert A. Stranger in a Strange Land. Mass-market paperback, 414 pages. A man raised by Martians comes to Earth and starts a hippie cult. 1962 Hugo Award winner. Herbert, Frank. Dune. Mass-market paperback, 536 pages. The story of a planet of spice and sandworms, its people, and its potential messiah. First in a series. 1966 Hugo and Nebula Award winner. Herbert, Frank. Dune Messiah. Mass-market paperback, 298 pages. Paul Atreides’s visions of the future come horribly true. Second in a series—read Dune first. Jordan, Robert. The Eye of the World. Mass-market paperback, 832 pages. Farm boy and friends need to save the world. First in a Hugo-nominated series. Le Guin, Ursula K. The Farthest Shore. Mass-market paperback, 197 pages. Ged must discover why the world is being drained of magic. 1973 National Book Award winner. Third in a series—start with A Wizard of Earthsea. Niven, Larry. The Integral Trees. Mass-market paperback, 272 pages. From back cover: “… a fully fleshed culture of evolved humans who live without real gravity in the gas torus that rotates about a neutron star.” 1985 Locus Award winner. Nix, Garth. Sabriel. Mass-market paperback, 496 pages. The daughter of the Abhorsen, who is charged with keeping the dead dead, must find her father and save her kingdom. First in a series. Powers, Tim. Expiration Date. Mass-market paperback, 544 pages. From back cover: “As a series of disasters strikes Los Angeles, a young boy inhales the last breath of Thomas Edison, and becomes a precious prize in a deadly hunt for the elusive vital spark.” 1996 Locus Award winner. Second in a trilogy. Pratchett, Terry. Lords and Ladies. Ex-library mass-market paperback, 400 pages. Elves are the uninvited guests at Lancre’s royal wedding. Fourteenth in a series, but you can really start reading Discworld anywhere. Pratchett, Terry. Men at Arms. Mass-market paperback, 400 pages. The Ankh-Morpork City Watch has new recruits, who have signed up just in time to deal with the Gonne. Fifteenth in a series, but you can really start reading Discworld anywhere. Rajaniemi, Hannu. The Quantum Thief. Mass-market paperback, 384 pages. From back cover: “In [Jean le Flambeur]’s last exploit, he managed the supreme feat of hiding the truth about himself from the one person in the solar system hardest to hide from: himself.” First in a series. Robinson, Kim Stanley. Green Mars. Mass-market paperback, 624 pages. The original Mars colonists have had children, and the children have their own opinions on Mars’s future. Second in a trilogy—read Red Mars first. 1994 Hugo and Locus Award winner. Robinson, Kim Stanley. Red Mars. Mass-market paperback, 592 pages. A hundred colonists plan to settle and terraform Mars. First in a trilogy. 1993 Nebula Award winner. Sanderson, Brandon. Mistborn: The Final Empire. Mass-market paperback, 672 pages. A thief with awesome powers puts together a team to overthrow his land’s thousand-year magical dictator. First in a trilogy, and where I’d recommend starting Sanderson. Sanderson, Brandon. The Well of Ascension. Mass-market paperback, 796 pages. It turns out the plan in Mistborn had some unexpected consequences. Second in a trilogy—read Mistborn first. Simmons, Dan. Hyperion. Mass-market paperback, 495 pages. Seven pilgrims travel to a planet’s mysterious guardian and tell each other their stories. First in a series. 1990 Hugo and Locus Award winner. Sterling, Bruce. Islands in the Net. Mass-market paperback, 396 pages. From back cover: “Now, Laura Webster is about to be plunged into a netherworld of black-market data pirates, new-age mercenaries, high-tech voodoo … and murder.” 1989 Hugo Award finalist. White, T. H. The Once and Future King. Mass-market paperback, 639 pages. Classic retelling of the tale of King Arthur, from boyhood to downfall. Omnibus. Willis, Connie. Doomsday Book. Mass-market paperback, 592 pages. A time-travelling historian is unexpectedly sent to 1348, just in time for the arrival of the Black Death. 1993 Hugo, Nebula, and Locus Award winner. Wilson, Robert Charles. Spin. Mass-market paperback, 464 pages. One night, the stars went out; the Earth has been encased in a barrier where a hundred million years pass outside for each inside. First in a series, although it stands alone well enough. 2006 Hugo Award winner. Wolfe, Gene. The Shadow of the Torturer. Mass-market paperback, 262 pages. A torturer’s apprentice leaves his guild and has adventures. First in a tetralogy. 1981 World Fantasy Award winner.